Today a friend of mine shared this link with me about Tentstation in Berlin, Germany. Tentstation is an urban campground located near Berlin's main train station and popular tourist destinations like the Brandenburg Gate. The mastermind behind the Tentstation project, Sarah Osswald, was interested in taking advantage of the opportunities inherent in "the concept of using fallow urban space" and "the idea of interim usage" to create an urban campground in Berlin. Worldchanging has explored these ideas before -- Julia Levitt wrote about the idea of flexibility and using every bit of urban space to its fullest in "Temporary Spaces and Creative Infill" last year; and the Dott 07 team brainstormed the possibility of urban camping in "Sustainable Tourism: Must Tourism Damage the Toured?" 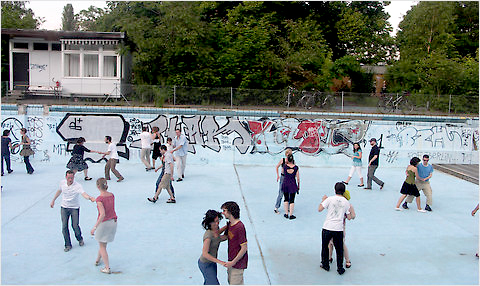 back in 2007 -- but the Tentstation project is the first I've heard of that moves urban camping from concept to reality and couples it with utilizing underused urban spaces. What a great pairing! import.export ARCHITECTURE (Oscar Rommens en Joris Van Reusel, architecten) have also explored ways of making urban camping a reality. Last year they designed a mobile urban camping unit (UC) intended to facilitate small scale urban camping. The structure is made of steel and supports four platforms on which tents can be pitched. The UC is meant to be flexible and mobile; it could be implanted in any city center to support an instant mini campground, "where adventurous city wanderers could stay overnight, meet other campers and find a safe shelter with basic designed practical facilities" (Dezeen). ...a new wilderness is developing. Cities are rapidly growing, becoming more complex, and rather than locking ourselves up in our protective boxes, what if we found a new way to to test ourselves in the throws of the urban wilderness? Rather than becoming intimately involved with nature, listening and understanding the landscape, we rediscover urbanity in a completely new way. Smells, sounds, people, paths, roads, parks, architecture all become things of exploration rather than simply parts of the sum. Import Export's 'tentscrapers' would facilitate that exploration. To get out there and be in the elements, to enjoy the city like one can enjoy nature, is what is so appealing to me about urban camping. And introducing the inexpensive nature of camping to city travel is a wonderful democratizing practice for tourism. 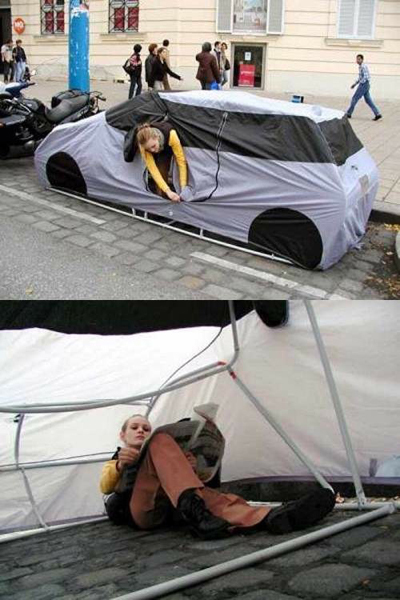 With the success of Tentstation in Berlin, and Import Export Architect's compelling vision of 'tentscrapers' it looks like urban camping is on the rise...but perhaps all we really need are car tents? Note: You may also be interested in this article on the Urban Voids design competition: "Filling Urban Voids . . . With Farms?" We published already the "tentscaper" project (nice name! 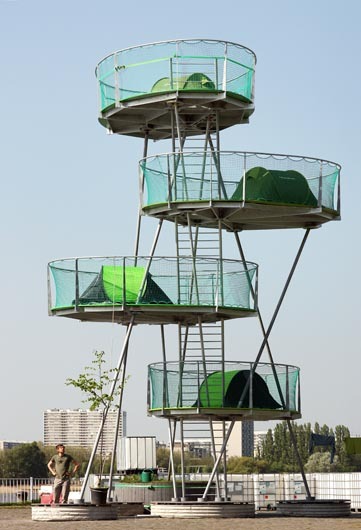 ), but I quite like this idea of temporary urban camping (in free or deserted allotments) that would bring new type of tourists in the center of cities. We could definitely think of "tent hotels", "tent-car park", etc. in the center of cities.